LOS ANGELES — Canadian Prime Minister Justin Trudeau is defending the North American Free Trade Agreement as an economic boon for the U.S. and his country, but he also urges for it to be retooled to lift workers who have been left behind. His remarks at the Ronald Reagan Presidential Library in Simi Valley, Calif., on Feb. 9 struck a co-operative tone at a time when President Donald Trump is threatening to withdraw from the 24-year-old pact that governs trade on the continent. 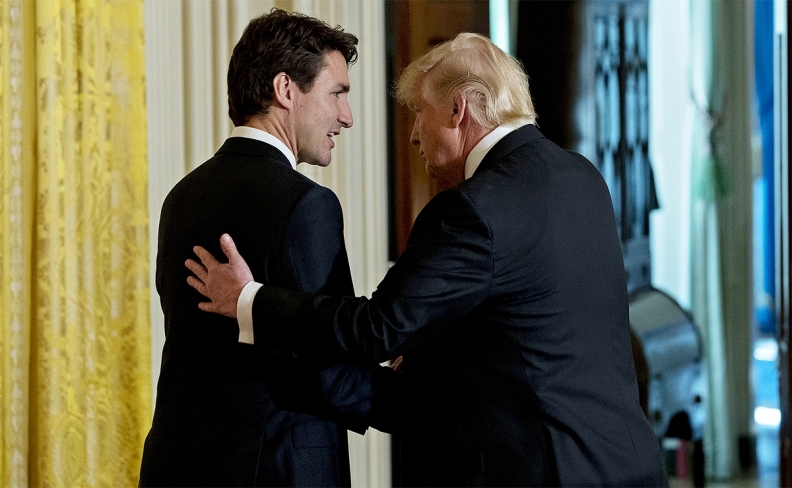 Trudeau said nine million jobs in America are tied to trade and investment with Canada and "the truth is that both Canada and the United States are winning. And so is Mexico. And that's exactly how we should keep it." But he also acknowledged that global trade is not working for everyone and said income inequality is growing worldwide. "We need to collectively do a much better job of ensuring the benefits of trade are shared more broadly, to more people," he said. He added: "President Trump and I agree about this: Too many people have been left behind, even as our economies surged." The accord, he said, should be modernized with "a willingness to compromise on all sides." Trudeau's stop at the hilltop library came during a swing through the U.S. in which he has warned Canada won't be muscled into a trade deal that is unfavourable to his country, and promoted Canada as a destination for California technology firms uneasy with shifting U.S. immigration policy. The next round of talks over the trade pact in Mexico later this month have loomed over the visit, which also included stops in Chicago and San Francisco. Trump called the agreement a job-killing "disaster" on the campaign trail. He has threatened to pull out unless the deal requires more auto production in the U.S., while shifting additional government contracts to U.S. companies. In his speech, Trudeau made repeated references to the historic connections between the two countries and argued that backing away from NAFTA could unspool deep ties across the continent — with an unknown cost. The location of the speech carried symbolic weight, alluding to the longstanding trade relationship between the U.S. and Canada. In 1988, Reagan and then-Prime Minister Brian Mulroney signed the first free trade agreement — a precursor to NAFTA. "Let us not raise fresh barriers between our peoples," Trudeau said.